Signs By Van is California’s Top Rated Local® sign company serving businesses all over California. With more than 30 years of experience in the sign making industry, we have mastered our trade and aim to be the best custom sign makers in California. Our custom sign services begin with you! We understand the importance of your brand and the value of representing your business quickly and accurately. As industry experts and a local business ourselves, we focus on the needs required for the perfect custom business sign. Our graphic designers will work closely with you to capture the look and feel of your business. From there, our experts will go to work and modify the design as needed, detail, and fabricate the sign until it is completed and ready for installation. All of our signs are crafted by skilled technicians in house to ensure the highest quality. Signs by Van is not an ordinary sign company in California. We don’t print signs — we build custom signage tailored to your business. If you’re looking for unique signage like large scale signs that can be seen from a distance, a custom sign that features artistic elements like gold leafing, carving, sandblasting—we’re the sign company you need. Browse our portfolio and check out our previous projects, you may recognize some from your favorite local businesses. Wineries, restaurants, small businesses, local organizations, and governmental agencies in Monterey County have trusted our sign company to build one-of-a-kind signs for years. 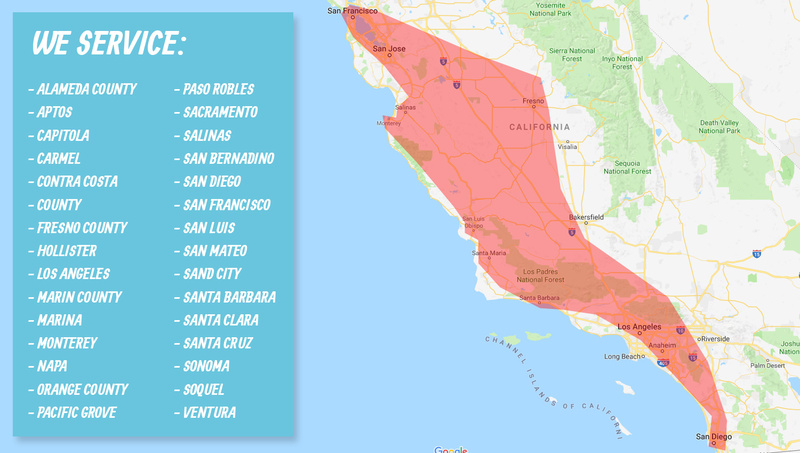 We’re proud to say that our services expand throughout the entire state of California! Monterey County will always be home, but we are excited to build custom signs in Alameda County, Fresno, Hollister, Los Angeles, Napa County, and more! Whether you’re a brand new business looking to stand-out from the crowd or your company has been in business for years and you need a new look, Signs By Van wants to build your sign! Contact us today to get started!